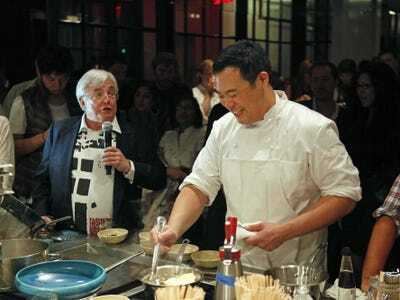 David Goldman/AP ImagesMaster chef David Chang (right). Foodies may know David Chang as the founder of Momofuku, an award-winning restaurant group that includes nine restaurants in New York City, five in Toronto, and one in Sydney. Now, the master chef is branching into tech, with a new food delivery app called Maple that will launch early next year. Chang will create a menu just for the delivery service, and new, seasonal dishes will rotate in everyday. New Yorkers can order menu items to be delivered through Maple’s mobile app, which will also be enabled for desktop. Chang won a prestigious James Beard Award in 2013. Momofuku Ko, Chang’s daring 12-seat tasting room in the East Village, has had two Michelin stars since 2008. He will serve as Maple’s Chief Culinary Officer, and he’ll be recruiting other top New York City chefs to join the company’s Culinary Board of Directors. The board members, who will be announced in the coming months, will advise on the menu. Maple will be launched in New York City in early 2015. Chang is joined by former High Peaks Venture Partners Entrepeneur-in-Residence Caleb Merkl, who will serve as Maple’s CEO; High Peaks partner Akshay Navle, who will be COO; and Thrive Capital partner William Gaybrick. Maple raised $US4 million in seed funding earlier this year, led by Thrive Capital. High Peaks Venture Capital, Bessemer Venture Partners, 14W, Momofuku, Blue Apron CEO Matt Salzberg, and angel investor Kal Vepuri also contributed to the round.